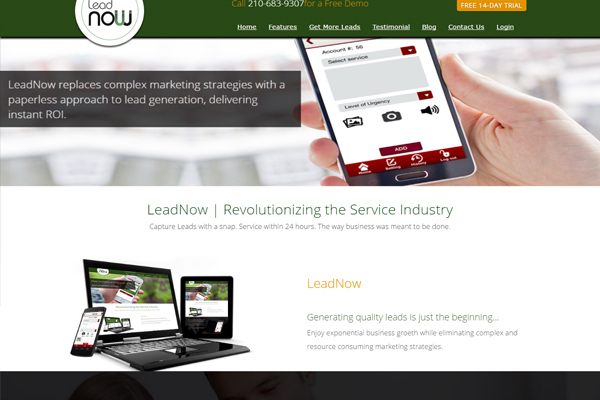 LeadNow helps you generate prospects while working in the field. Time and time again, you,ve heard your clients report that they never received a call back after requesting additional services from your technician. This is a lead that you cannot afford to go: you need it now. With LeadNow, never miss a warm lead again and give your business a marketing power boost without the need for a maximum budget or a complex marketing strategy. As simple and as effective as lead generating gets, improve your revenue while improving your teams communication. Easy to Use Interface – Within seconds technicians can snap & save pictures, add a quick description, service type, voice record in-depth details and even give a lead rating – cold, warm, hot. Eliminate Lag in Communication – Instantly notifies the sales team with all the lead information, pictures, notes and recordings. No Loss of Time – No more waiting several hours or days for technicians to reach the office. Efficient – No more scheduling unnecessary estimates. Quick and Effective – No more two week delay for your customers. Better ROI – Instant reporting to grow your business and distribute commissions with ease. Teamwork and Co-ordination – Instant communication between technicians, sales team and management; each can view the lead status & assigned team members in real time. This builds trust in your employees and encourages them to submit more leads. Automation – No more wasted paper; this is an entirely paperless system.